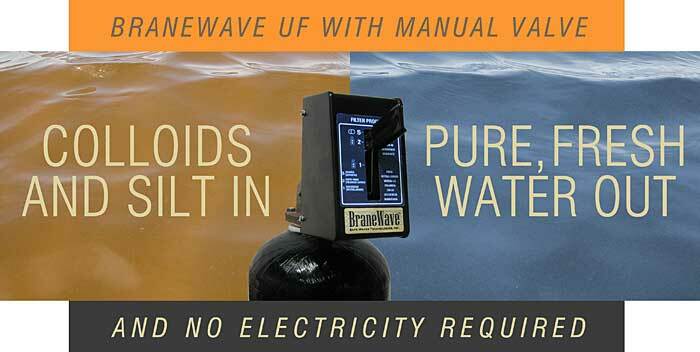 Using only available water pressure (20 to 120 psi), BraneWave with manual valve is designed for electricity-free environments including remote seasonal homes, third world areas, and disaster recovery zones. SWT's BraneWave UF System is the freestanding, 0.02 micron, ultrafiltration unit which removes suspended solids, colloids, fine silt particles, and waterborne pathogens to provide particulate-free, pure water on demand. and with SWT's optional, manual, 3-position valve (service, backwash, rinse) — no electricity! For conventional, electric-powered applications, BraneWave is available with an automatic backflush control valve (with solar panel option). Copyright 2015-2019, Safe Water Technologies, Inc.